Wells Fargo Bank awarded a $50,000 grant Tuesday to SF State that will support mentorship programs at six San Francisco middle schools that help students from low-income and underrepresented groups prepare for college. 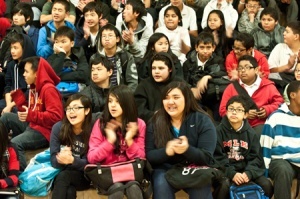 A photo of students at Martin Luther King Middle School. SF State partners with the San Francisco Mayor’s office and San Francisco Unified School District to run SF Promise, the largest and broadest-based public school-university partnership in Northern California. The program guarantees access to SF State to all qualified San Francisco public school students regardless of financial barriers. Wells Fargo Executive Vice President Michael Billeci and Wells Fargo Foundation Vice President Mario Diaz presented a $50,000 check to SF State President Robert Corrigan at Martin Luther King Middle School on Tuesday. San Francisco School Board President and mayoral advisor Hydra Mendoza and San Francisco School Superintendent Carlos Garcia were also in attendance. 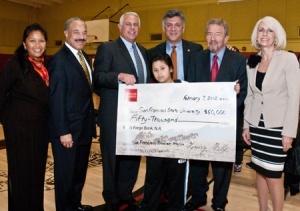 Dignitaries from the San Francisco Mayor's Office, San Francisco Unified School District, Wells Fargo Bank and San Francisco State University, and a Martin Luther King Middle School Student, with the check from Wells Fargo to SF Promise. Billeci said Wells Fargo was proud to support education. "That's what SF Promise is all about, giving you a great education," he told students assembled in the gymnasium. "The promise of a college education is the promise of a bright future for these students as well as those who will live and work beside them," President Corrigan said. "In the coming years, SF Promise aims to double the number of San Francisco public high school graduates who receive post-secondary education, and at the same time, increase the number of college graduates from underrepresented groups." Representatives from Wells Fargo Bank and students from Martin Luther King Middle School hold a check from Wells Fargo to SF Promise. The core initiative of SF Promise is The Success Through Opportunity Motivation and Promise (STOMP) Mentorship program. Through STOMP, SF State graduate and undergraduate students return to their middle and high schools to provide SFUSD students assistance with college, career, health and other development challenges. Mentors provide approximately 1,300 hours of mentoring per school site each year, and there are currently large waiting lists for mentors and mentees. SF Promise also provides standardized test preparation for seventh-grade students of underprivileged backgrounds and every SFUSD 10th-grader, and a college and career fair at SF State that is the largest in San Francisco. To learn more about SF Promise, visit www.sanfranciscopromise.org.